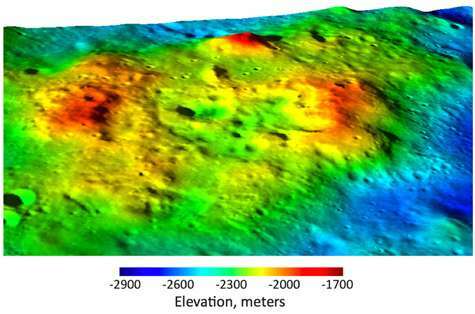 (PhysOrg.com) -- Analysis of new images of a curious hot spot on the far side of the Moon reveal it to be a small volcanic province created by the upwelling of silicic magma. The unusual location of the province and the surprising composition of the lava that formed it offer tantalizing clues to the Moons thermal history. 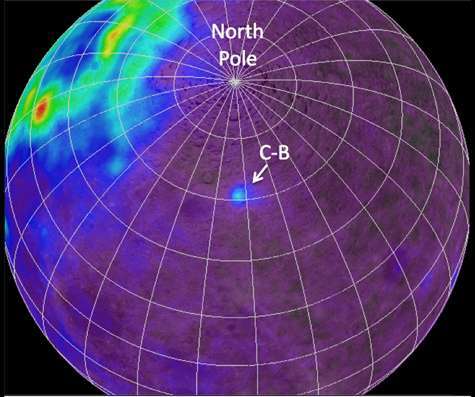 The hot spot is a concentration of a radioactive element thorium sitting between the very large and ancient impact craters Compton and Belkovich that was first detected by Lunar Prospectors gamma-ray spectrometer in 1998. The Compton-Belkovich Thorium Anomaly, as it is called, appears as a bull's-eye when the spectrometer data are projected onto a map, with the highest thorium concentration at its center. Recent observations, made with the powerful Lunar Reconnaissance Orbiter (LRO) optical cameras, have allowed scientists to distinguish volcanic features in terrain at the center of the bull's-eye. High-resolution three-dimensional models of the terrain and information from the LRO Diviner instrument have revealed geological features diagnostic not just of volcanism but also of much rarer silicic volcanism. The volcanic provinces very existence will force scientists to modify ideas about the Moons volcanic history, says Bradley Jolliff, PhD, research professor in the Department of Earth and Planetary Sciences in Arts & Sciences at Washington University in St. Louis, who led the team that analyzed the LRO images. To find evidence of this unusual composition located where it is, and appearing to be relatively recent volcanic activity is a fundamentally new result and will make us think again about the Moons thermal and volcanic evolution, he says. The work is described in the July 24 advance online issue of Nature Geoscience. Lunar volcanism is very different from terrestrial volcanism because the Moon is a small body that cooled quickly and never developed rock-recycling plate tectonics like those on our planet. The Moon, thought to have been created when a Mars-size body slammed into Earth about 4.5 billion years ago, was originally a hellish world covered by a roiling ocean of molten rock some 400 kilometers deep. But because the Moon was small and had no atmosphere, the magma ocean cooled quickly, within perhaps 100 million years. Eventually lighter minerals such as feldspar crystallized out of the magma and floated to the top to create huge masses of feldspathic rock that formed the lunar highlands. Denser iron- and magnesium-rich minerals sank when they crystallized, forming the upper part of the Moon's mantle. The differentiation of the crust and mantle was followed by a wave of volcanic activity between about 3 to 4 billion years ago, when basaltic lavas erupted on the lunar surface, filling old impact craters and other low spots to form the lunar mare. One of the mysteries of lunar volcanism is the unequal distribution of these flood basalts. Nearly a third of the Moons near side is covered by ancient flood basalts but the Moons far side, where the crustal rocks are thicker, has much less. Moreover, almost all of the volcanism on the Moon is basaltic rather than silicic, enriched in minerals containing the elements iron and magnesium rather than the elements silicon and aluminum. Earths continental crust, which reflects active geological processes such as subduction, magma intrusion and mountain building, includes many rocks whose compositions are intermediate between basalt and silica-rich rocks like granite, which are common on Earth. On the Moon, on the other hand, there are many basaltic rocks and only a small fraction of granite. Rocks of intermediate composition are all but missing. It wasnt so very long ago, Jolliff says, that scientists talked about the Moon as having two sorts of terrain, the dark maria, or seas, and the light terra, or highlands. This simple picture of the Moons geology served for many years, but in 2000, Jolliff and his colleagues in the department of Earth and Planetary Sciences and WUSTLs McDonnell Center for the Space Sciences introduced a concept in which they distinguished three different terranes, or regions of the Moon with distinctive geologic histories. As the magma ocean cooled, Jolliff explains, elements such as thorium were preferentially excluded from crystallizing minerals, forming pockets of KREEP-rich magma sandwiched between the crust and mantle. A concentration of heat-producing elements under the Procellarum KREEP Terrane may be partly responsible for the intensive mare volcanism there. The maria, Jolliff explains, were formed when the hot radioactive elements melted minerals deep in the Moons mantle, forming basaltic lava which erupted through fissures onto the Moons surface. Well over half the Procellarum KREEP Terrane was resurfaced by volcanism. Although most of the volcanism was of the basaltic variety, resulting in the large, dark patches on the Moon visible to the unaided eye from Earth, a much rarer form of volcanism, one that produced lavas rich in silica, also occurred in the PKT. These volcanic deposits are known as red spots because of their spectral characteristics, and recent results from the LRO spacecraft confirmed their silica-rich compositions. The red spots include some with distinctive dome shapes, some quite large, and all within the boundaries of the PKT. Ever since the Lunar Prospector mission first revealed the thorium-rich bull's-eye isolated on the far side of the Moon and distant from the Procellarum KREEP Terrane, Jolliffs group has been curious as to what it was. When the Lunar Reconnaissance Orbiter was launched in 2009, we were finally able to image it at high resolution, he says. At the center of the thorium bull's-eye is a small volcanic complex, 25 to 35 kilometers across, depending on the direction, nestled between the Compton and Belkovich craters, which are 162 and 214 kilometers across, respectively. Significantly, the Compton-Belkovich Thorium Anomaly lies about 900 kilometers from the northeastern extent of the Procellarum KREEP Terrane. 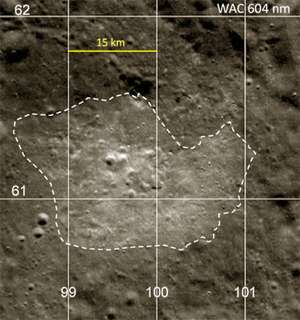 In the initial LRO images, taken with the orbiters Narrow-Angle Cameras (NACs) during the commissioning phase of the mission, we could see lumpy terrain and collapse features that might be volcanic, Jolliff says. But impacts that blast material out of craters and onto the surrounding surface can also produce lumpy or mountainous deposits. To be sure we were seeing volcanic features, we looked more closely, using images from the NACs taken during the mapping phase once the orbiter had reached its 50-kilometer circular orbit. The NACs have telescopic optics and produce images with a 50-centimeter-per-pixel resolution when in a 50-kilometer-altitude orbit. Among the diagnostic features revealed by these perspective views are a mountain whose features are commonly obscured by shadow, but when viewed with the terrain model, can be seen to have a depression at the summit, and what appears to be an area of the rim where a breach occurred together with subsequent collapse and mass wasting (downslope movement of rock or regolith). The scientists bolstered the case for volcanism by taking cross sections through the terrain and measuring slopes along these cross sections. This showed, for example, that one of the domes has a summit plateau with a broad central depression, both characteristics typical of a volcano. The steepness of the volcanic features provided clues to the composition of the lava that formed them. Whereas the basaltic shield volcanoes elsewhere on the Moon typically have slopes of 7 degrees or less, the Compton-Belkovich volcanoes have slopes that reach 20 to 25 degrees, suggesting they were formed by a more viscous lava. Another piece of the puzzle came from one of LROs other instruments, a thermal radiometer called Diviner. (This instrument records radiation in the infrared part of the spectrum, including bands sensitive to mineralogy as well as to temperature.) Working with Ben Greenhagen, PhD, a former graduate student at Washington University in St. Louis and now the deputy principal investigator of the Diviner instrument, the team was able to tell there was a concentration of silica-rich rock, such as granite or rhyolite, at the Compton-Belkovich volcanic feature. How did the Compton-Belkovich volcanic feature form? Jolliff and his team cant yet be sure and are reluctant to speculate, but they suspect the newly discovered volcanic province might be much younger than most of the volcanic features in the Procellarum KREEP Terrane. Although we know from direct analysis of lunar rock samples that most of mare volcanism occurred 3 to 4 billion years ago, we can see from orbit some mare basalt flows that might have occurred as recently as 1 billion years ago. Jolliff says. We dont have a way to get an absolute date on the Compton-Belkovich volcanic feature because we dont have rocks in hand, Jolliff says, but since there are relatively few craters, the surface actually looks pretty fresh. And we see small-scale features that havent been completely beaten up and obliterated by the impact process. If this volcanic province formed very late in the game, it couldnt have been due to radioactive decay because those heat sources diminish with time and it gets harder and harder to get lavas to the surface. But, he says, the Moon may still have a molten outer core. The GRAIL mission that will launch later this year might confirm this idea. But if the outer core is molten, it might generate pulses of heat. After all, on Earth we have hot spots like the Hawaiian volcanic chain that are associated with deep plumes of heat. A pulse of heat from deep in the mantle might melt a pocket of KREEP-rich rock at the base of the crust left by the original crystallization of the magma ocean, Jolliff says. The melt might have risen from the base of the crust to near the surface, inflating the surface in a low dome when it ponded there. It might have been like the Novarupta dome in Katmai National Park in Alaska. A very viscous lava bulges up like a balloon coming up from below. It inflates, and the surface may split and crack, and then it just solidifies in place, he says. As these volcanic features pushed upward, other parts of the surface nearby may have collapsed, forming an irregularly shaped caldera in the center of the feature, Jolliff says. isnt it true (or at least believed) that the big dark basalt marae on the near side were caused by lensing shockwave effects of huge meteoroid/asteroid impact on the far side, it might well be that those impacts dug deep holes on the far side to release deep silicic vulcanism, while the secondary shockwave accumalated on more shallow depths on the near side to cause basaltic flows. Could it be that the collapsed caldera in the middle is not a caldera, but the smoking gun, the point where a 20 km sized asteroid struck? if this is not a crater filled up by impactvulcanism, then where are the huge impactcraters to have caused the marae on the other side? No, that's not the current belief at all. The mare are much younger than the craters. You can look all that up on wiki, or any number of other sources. Just google it, if you really want to know more. Your idea is listed as the first common misunderstanding about the mare on wiki, so you're not alone in thinking they are related to impact events. That used to be the main theory, but it's outdated and now obsolete. The current belief is that they are entirely geological. They are just working on the exact mechanism, time frame, order of events, etc. that led to the volcanic activity at this point. It's just the details they aren't sure about, and why there's so much on one side but not the other.
" were formed when the hot radioactive elements melted minerals deep in the Moons mantle "
..so is this, or was this similar to the natural nuclear reactor found in Oklo ? Would it be reasonable to assume that the earth was also a molten ball around the time of the near side formation and activity, therefore effectively constantly supplying heat to the side of the moon facing the earth? Not much, but enough that internal pressure release was confined to the slightly warmer side? I don't think so. The age of the mare isn' that old. The surface of the Earth and the Moon should both have been solid by then. If you look at the moon, you'll notice that the mare are inside craters. That means the craters are older than the lava which filled them (you can read about that on the mare wiki page). We don't have an exact age because the crater dating method has a wide margin for error, but the craters obviously happened when the surface was already solid. At the time when the Earth and Moon were both still molten, I don't think the Moon would have been tidally locked yet either. Can anybody verify or correct that? I'm not sure.